The first time I tasted Bacalhau à Brás I spat it out in surprised horror, downed a glass of water and swore at the assault on my taste buds. My tongue reacted in much the same way as that of a slug when you pour neat salt on it. I realise a tongue and slug comparison is an unusual analogy, but bacalhau is extremely salty if it’s not prepared properly. We were out to lunch with friends this week so when I saw Bacalhau à Brás listed on the menu board, as the “Prato do dia” (dish of the day), I groaned as I related my previous gastronomic experience! 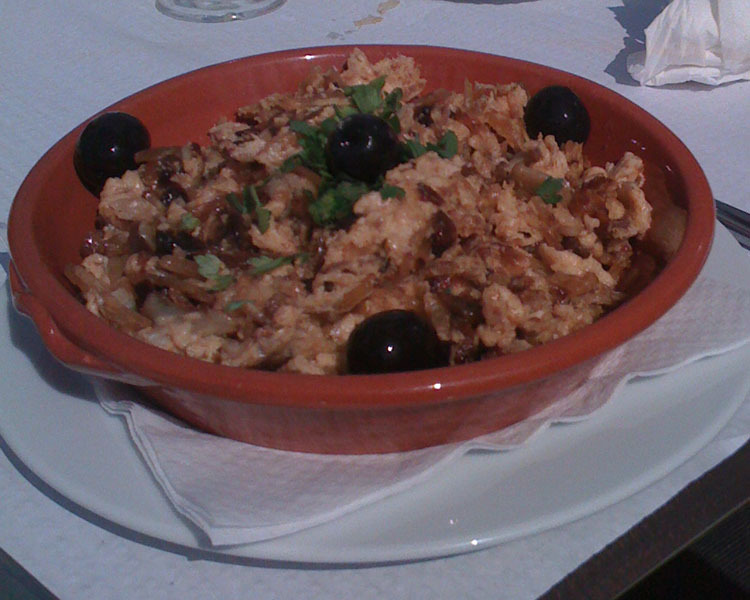 However, our friend ordered the bacalhau assuring me it was his favourite and no, it was not salty and no, it could not be used to kill off the slug population in my garden. “Live dangerously” I thought, “Hell, why not?” so fingers firmly crossed, I ordered the Bacalhau à Brás. I’m so glad I put my previous salt and slug experience behind me and gave the dish another try; on this occasion it was most definitely an “orgasmic foodie” moment. Hmmmm absolutely delicious! On returning home I immediately trawled the internet for Bacalhau à Brás recipes, but there were so many variations I did not know where to start. Feeling slightly frustrated I enlisted the help of friends and fortunately someone found a simple recipe in their Portuguese cook book. After adapting their recipe to include garlic and a bay leaf (I knew the Bacalhau à Brás I’d eaten had garlic in as Mr Piglet said I smelt of garlic for days). I was now ready to “rock n’ roll” (start). Well, not quite, I still needed Bacalhau (pre-soaked) and something called Batata Palha, onions, garlic etc, etc. Now on a mission and clutching my shopping list off I went to the local supermarket. Waiting my turn to be served at the meat counter I dubiously studied the packet of Riberaleves (pre-soaked cod-fish) I’d selected from the freezer section. Only in Portugal could you enlist the butcher’s help with fish and receive a friendly response. Wehn it was my turn to be served I held up the frozen packet of Riberaleves and tentatively explained I was attempting to cook Bacalhau à Brás. He gave me a wonderful smile, assured me it was “facil” (easy) and immediately engaged the help of another colleague. After a lengthy discussion they triumphantly produced another packet of Riberaleves where the fish was already shredded. I then asked about the mystery ingredient “batata palha” and a packet of chipsticks (potato straws) from the crisp stand seemed to be the answer. He could probably see by my surprised expression I was not convinced so nodded his head vigorously while emphasising the point with “bom, muito bom” (good). I’d planned to use normal potatoes, although the challenge how you could chip potatoes that thinly, remained a mystery. Perhaps a packet of cooking chipsticks WAS the answer. This recipe is surprisingly easy as it is quick to prepare and cook. 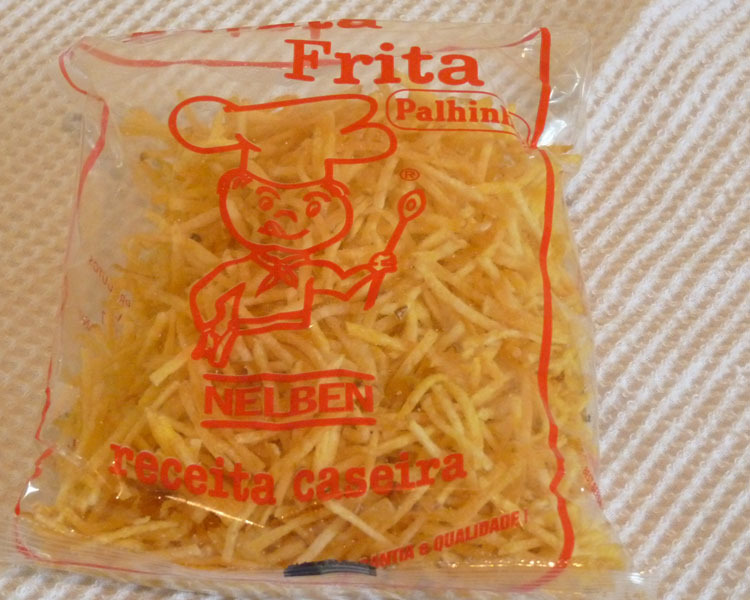 500gr very finely chipped potatoes (like match sticks) or Batata Palha or Frita Palhini. If you are using normal potatoes fry the “chips” lightly in oil, drain and then set aside. Boil the shredded cod for about 10 minutes (until tender). Heat olive oil in a stew pan. 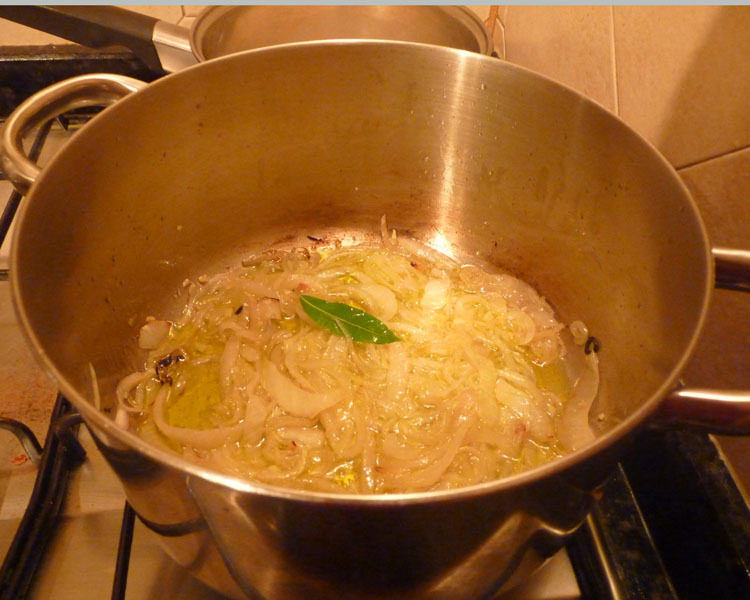 Add the finely sliced onions, garlic and bay leaf and season with pepper and sparingly with salt. Fry onions until soft and semi caramalised. Once cooked remove bay leaf. Drain bacalhau and add to stew pan with onions. Mix well. Cover the pan and simmer for 3-4minutes. Add Frita Palihini and parsley to pan and mix with onions and bacalhau. 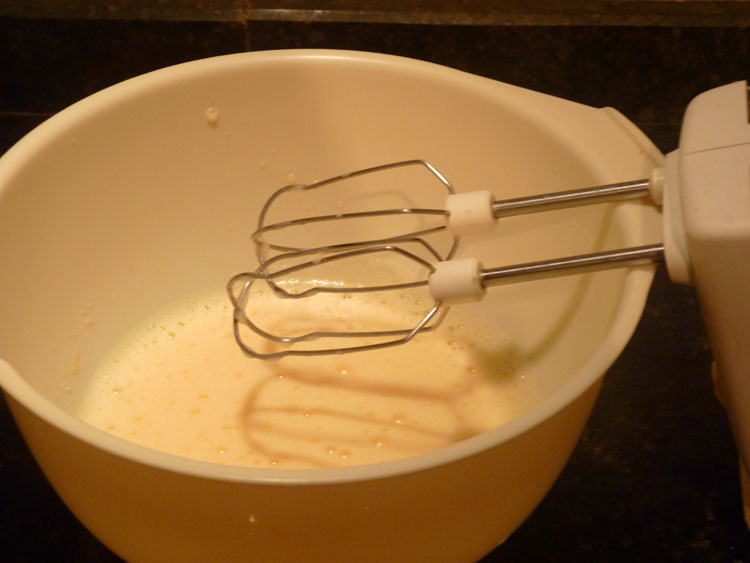 Whisk eggs until frothy and add to pan. Season with pepper, and salt if required. Gently mix all the ingredients together until the egg is firm , but not rubbery. Serve on a tray or indiviual dishes and garnish with the black olives (remove stones) and parsley. 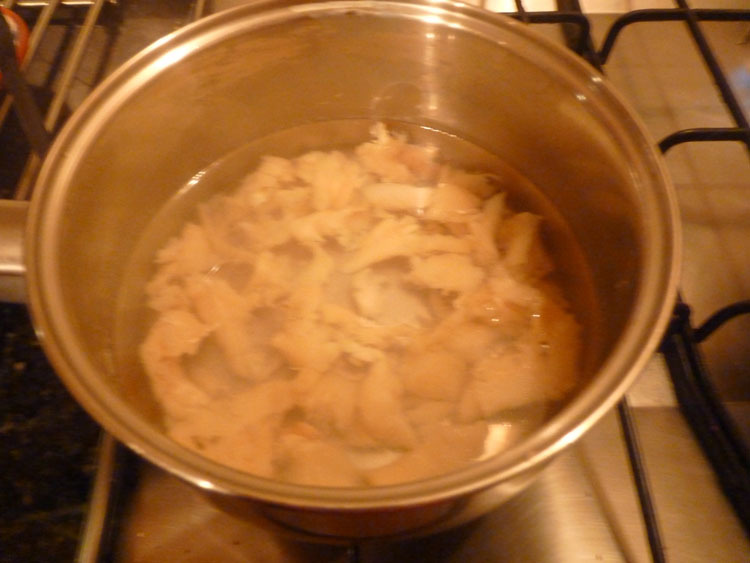 Intead of boiling the cod, mash and fry gently with the onions and matchstick potatoes. Any further tips most gratefully received! NaNoWriMo – am I crazy? We have bacalau here in the DR, but it comes in a cardboard box which is kept under the counter at the local corner shop. No plastic packets, just loose and you by it by the pound. It is just as you described – horrid! We eat it with rice and it is one of my most unfavourite Dominican dishes. However, I will give your method a go to see if I can make it somewhat more palatable – so thanks very much! Sorry if I am laughing aloud [that’s good for the soul anyways!!] – my feelings towards bacalao are exactly the same, but just perhaps I should be fair and try it again? Here in Oz, it is the same – stiff as a board, and I was taught to soak it overnight, changing the water once if i just happened to need to go to the bathroom during the night 😉 ! Glad you enjoyed it the 2nd time round, PiP! 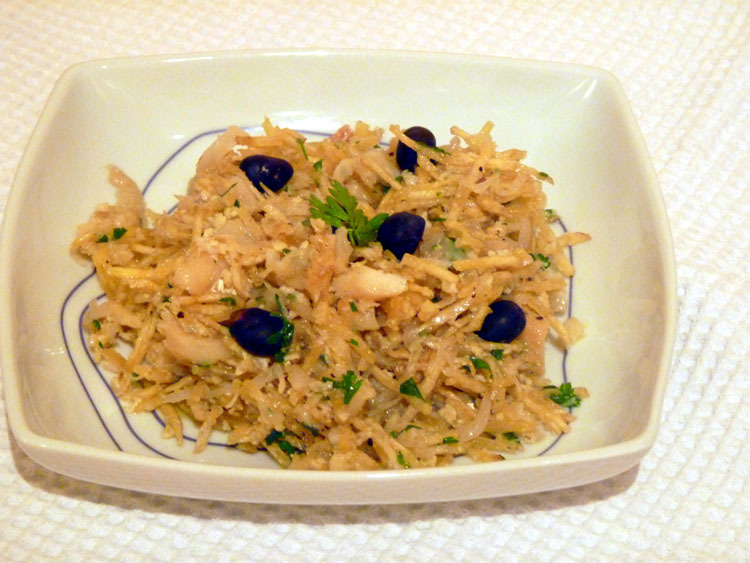 I love Bacalhau in any way it’s done! I also fry the shredded codfish (after it has been boiled). We don’t get the luxury of shredded codfish in Australia, nor have I ever seen the stick potato chips here, so I cut potatoes thinly and fry them too. EHA – you need to soak it at least 48h and change the water at least once a day, otherwise it will be very salty still. Dear Sami Veloso: thanks heaps! You have made me interested: shall try!! Thanks for reading 🙂 ! Shi Sami, seems the technique is all in the soaking process and one that must be done properely! This is so nifty. I’m not sure which is more fun. The tasting, the cooking or the wonderful community shopping experience. Please keep sharing more. What an educations. Iwas thinking of trying this until I saw Sami recommending soaking for 48 hours! I don’t have enough patience! I do like cod, so I might cheat! I find it difficult to understand how a fish that is not caught locally (it is imported) is the national dish! I am glad you have suggested Riberaleves – I have never heard of it. I will definately give this recipe a go, it looks simple and tasty. Hi Clara, Fernanda explains below why it is still a national dish 🙂 I’d never heard of it until Mara suggested it a while back. You will see it in the Freezer section. It is expensive, but the pack I bought was under 5euros and will give us two meals. NExt time I will try proper chips. I´m so glad you gave it another go becuase rPortugal really does excel at the salt cod dishes. And well done on making a dish yourself too! Ah, that´s a lovely thing to say! This recipe sounds alright (minus olives). Thanks for sharing it. I think the ingredients were recommended by the butcher were deff a short cut. Dear PiP don’t fry your bacalhau without having, at least, lightly cooked it first. 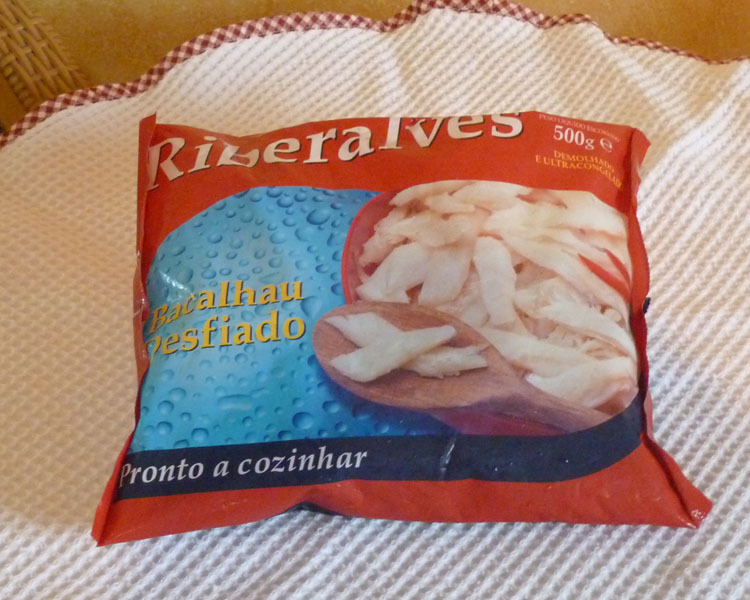 The price of that Ribeiralves packet is equivalent to a medium size bacalhau that’s why we don’t use it (and the same for those batata palha packets). Home made Bacalhau à Bráz is done with “normal sized” potato straws, and your husband was right garlic and bay leaf are essential. If you ever decide to soak bacalhau, put the fish skin up not down, it will loose the salt easier. MiniClara – bacalhau now is imported but till around 1970 we had one of the biggest fleets of Bacalhoeiros (“bacalhau” ships), and an huge related industry in northern Portugal. Hello Fernanda, thank you for letting me know a little history of bacalhau. I will do more research to get a full picture. The Bacalhoeiros fleets sound amazing and I would love to know more about them. I’ve tried various ways to eat “Bacalhau” and have to admit that I haven’t as yet come up with one that I thought was even slightly edible so I’m looking forward to having a go at this recipe. I just love the way you have illustrated the recipe with gorgeous photos of each step. Ribeiralves cod is grossly expensive! The only time I bought it was one Christmas when I forgot to buy and soak “normal” dried cod in time. Bom Apetite! Just right for feeding the slug population! No I did not mean you were the slug population I meant the slug population in gardens! I know. The 😦 face was for the slugs. PiP, this is one of my favourite ways to eat bacalhau. In one of your replies, someone suggests using fresh cod. Note that the taste is very different. Soaking over 48 hours is not so bad, you just need to plan in advance. As a plus, you can buy lots of cod, soak it all for 48 hours skin up changing the water 3/4 times and then freeze the pieces, ready to cook. I usually bring packs of shredded dry salted cod to the UK so that I can cook it here, and after soaking, I just squeeze it to drain the water and fry straight. It is a bit different and it definitely has to be consumed there and then, but I personally prefer it to the boil-first version (more common in restaurants). ‘orgasmic foodie’ – love that term! Yum! Looks great! Try frying left overs in some olive oil and lots of garlic. “ropa velha” 😉 Its amazing how versatile this fish can be.